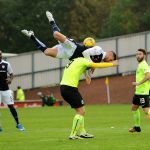 Raith and Hibs shared a point after a bruising draw at Starks Park, with the visitors moving to the top of this season’s Scottish Championship table following Queen of the South’s unexpected home defeat to Morton. In a match punctuated with niggly fouls and a first-half lacking anything in the way of momentum or flow, the hosts struggled to make their numerical advantage pay in a second half in which the visitors carved out the better chances. 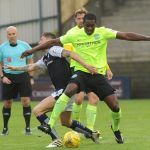 The first-half sending-off of Marvin Bartley – for violent retaliation following a Bobby Barr foul – gave Raith the opportunity to stretch Hibs during the second half; however Hibs’ industry and determination held Raith at bay, and created several openings to take all three points. With seven meetings between these sides last season, neither side could rightfully claim the edge over the other. 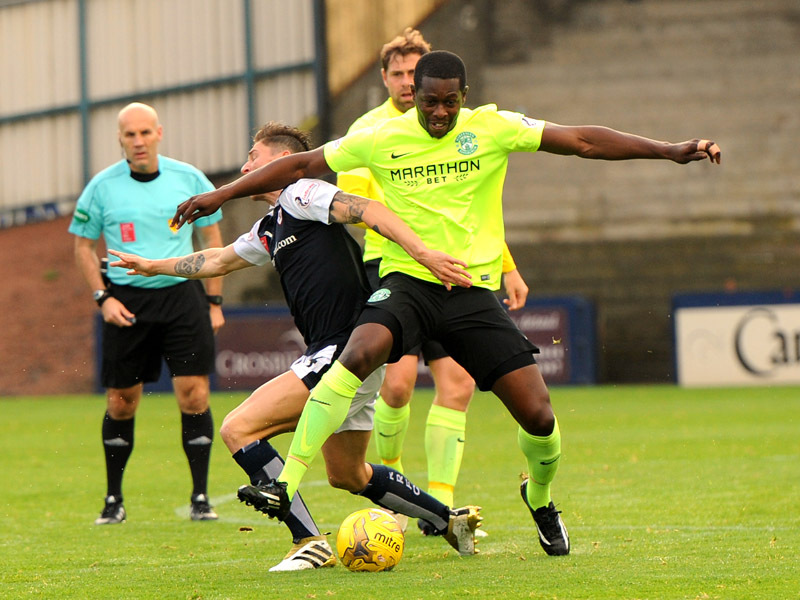 Hibs arrived at Starks Park on the back of a horrendous run of form, judged against their own excellent recent standards. Having opened their Championship campaign with five consecutive victories, Hibs hadn’t won in their previous four – draws against Dundee United and Queen of the South sandwiched by defeats to Ayr and St Mirren. Neil Lennon, in trying to revitalise his squad, sent out an attacking line-up: Cummings, Keatings, and Holt all started, with Fyvie and McGinn both looking for every opportunity to scamper forward. Israeli goalkeeper Ofir Marciano continued in goal. 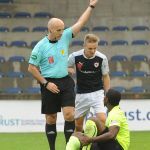 Raith have also suffered a disappointing recent spell, losing four of their last five, with injuries to several starters contributing to the loss of form. Iain Davidson was drafted in as cover at right-back, with both regular starter Jason Thomson and emergency replacement Liam Smith out injured. Benedictus and M’Voto started at centre-half, sure of a physical afternoon against robust opponents. Two changes from last week’s defeat at Cappielow saw Matthews start in midfield to cover for Davidson’s drop to right-back, and Rangers’ loanee Jordan Thompson in for Scott Roberts. The match started under clearing skies – heavy rain and thick clouds had covered the Fife coast during the morning, with a downpour a real threat. The pitch had a sheen of water across its surface, making ball-control difficult. The opening minutes saw a number of fouls – borne as much from mis-control as from lingering enmity between the two sets of players. McGregor blocked McManus, M’voto grappled with Holt, and Bartley rattled Callachan in the opening five minutes. Roberts’ deflected shot was held by Marciano in the game’s first chance. Hibs’ front-man Jason Cummings showed his mobility early on, dragging defenders into midfield, and darting back toward goal, creating space for himself and others. An early breach forced M’voto to concede the match’s first corner. At the other end, a splendid shot from Barr fizzled just wide. Following a blocked Holt shot, Hanlon’s glancing header from Keatings’ corner skimmed Cuthbert’s cross-bar. 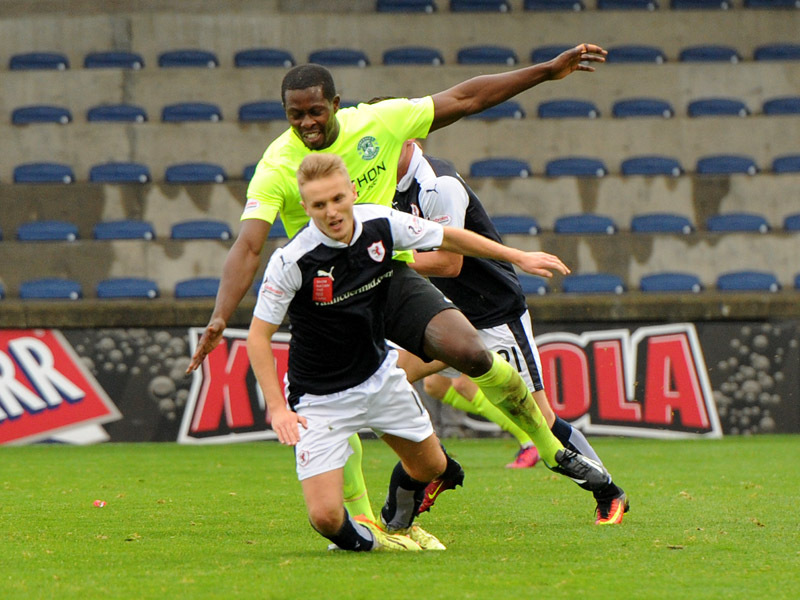 Raith’s centre-halves Benedictus and M’Voto both had excellent matches. 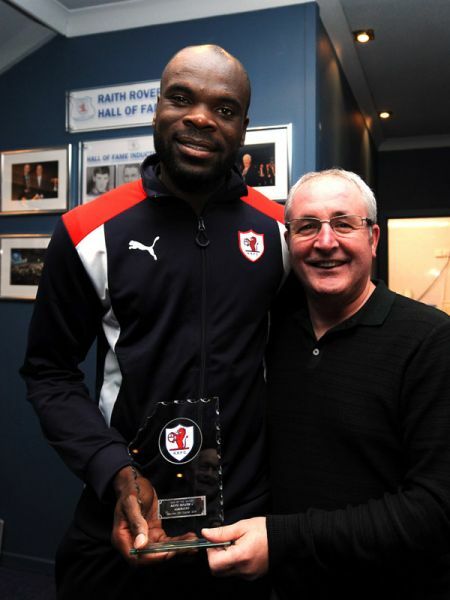 M’Voto was awarded sponsor’s ‘Man of the Match’, whilst his defensive partner won header after header. Against the hefty Grant Holt and with the pace and guile of Cummings to contend with, today’s was a sterling performance by both men. 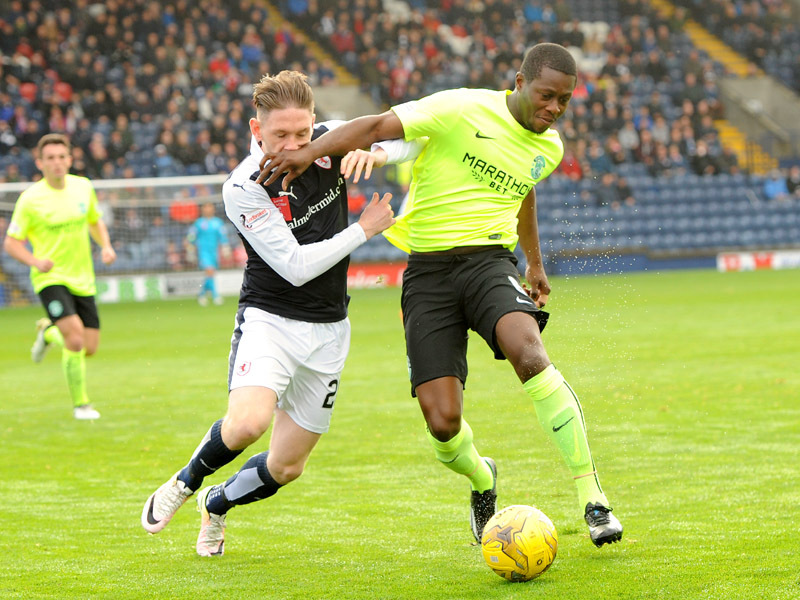 Holt’s first-half booking was borne largely of frustration at the steadfastness of Raith’s back two. On the wet pitch, tackles were flying in – some well-judged, others less so. In the often artificial and synthetic modern game, the slide-tackle is becoming something of a lost art – Callachan and McHattie executed two excellent examples of the craft either side of the half-hour (McHattie winning extra plaudits for finding Pratt Street with his clearance). 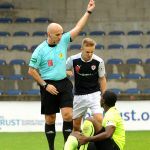 Referee Finnie sought to play advantage to cover some of the half’s poorer challenges, but often required to stop play to admonish the offenders. McManus clipped Stevenson, earning yellow, and Holt fouled regularly and often. In the run-up to half-time, Raith pushed and probed, but concentrated on switching the ball from left to right, looking for gaps in their opponents’ rear-guard. The hosts seemed unable to really up the tempo. 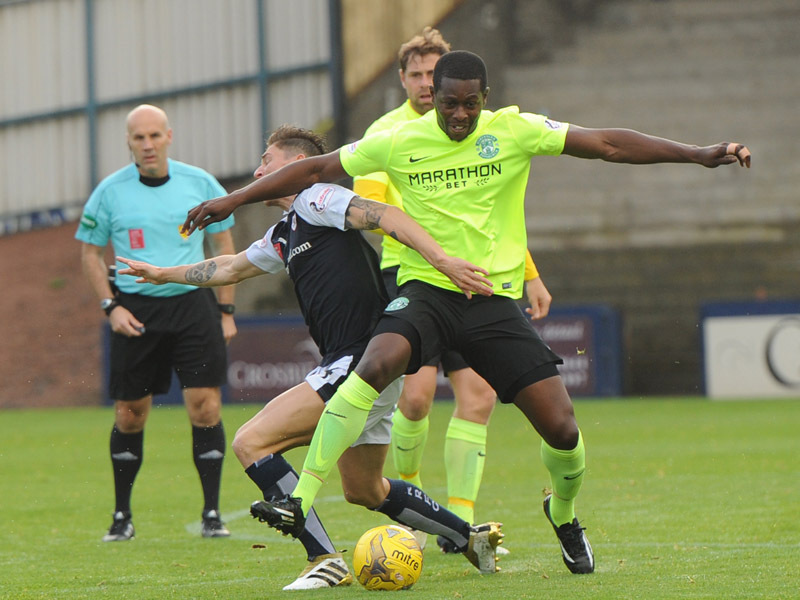 Hibs were able to reach the half-time whistle without facing the heavy bombardment which can often follow a red card. 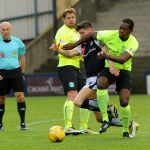 The second-half started with Hibs at full throttle – there was to be no defensive re-organisation from Neil Lennon’s side. With Bartley absent, the back-four of Stevenson Hanlon McGregor and Gray clearly felt confident enough to allow Hibs to begin the second period on the front foot. Within moments, Hibs fans howled for a penalty as Benedictus and Holt clashed at a corner. 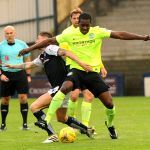 Moments later, Holt slid dangerously at an aerial McHattie – on a different day, the clumsy encounter could have produced a second yellow, leaving Hibs with nine. 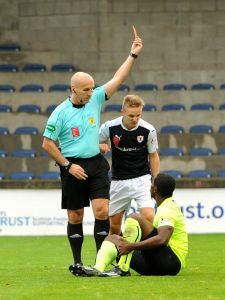 At the other end, a thoroughly entertaining personal battle on Raith’s left – Bobby Barr’s trickery and electrifying wing-play against Danny Gray’s determined defending at full-back. Gray blocked numerous crosses, while several others whizzed through the Hibs area as Barr reached the Hibs’ by-line. This is what football is all about – honest endeavour from dedicated and skilled professionals, giving a captivated crowd a real sense of anticipation every time battle was joined. 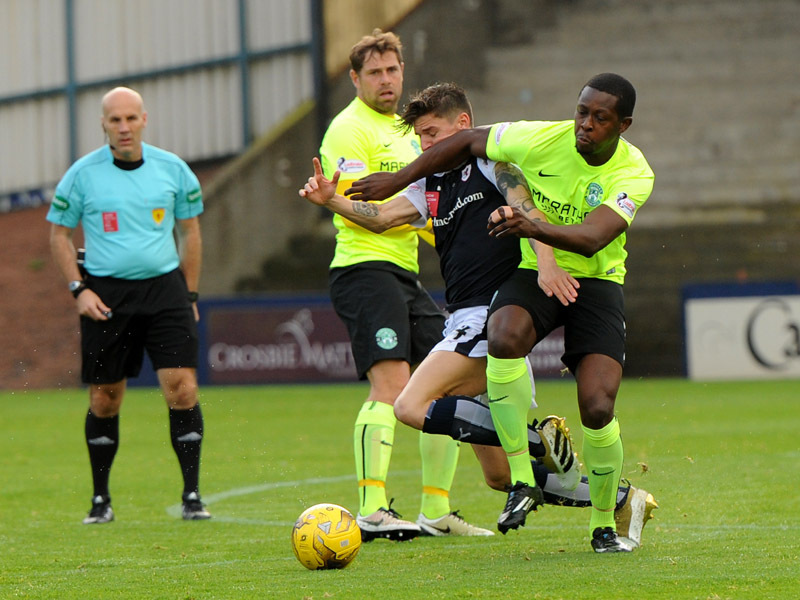 Both sides had chances as the half wore on, although it was Hibs who generated the greater momentum. Matthews was booked for a flying hack at McGinn, and McHattie upended Gray, also drawing a yellow. 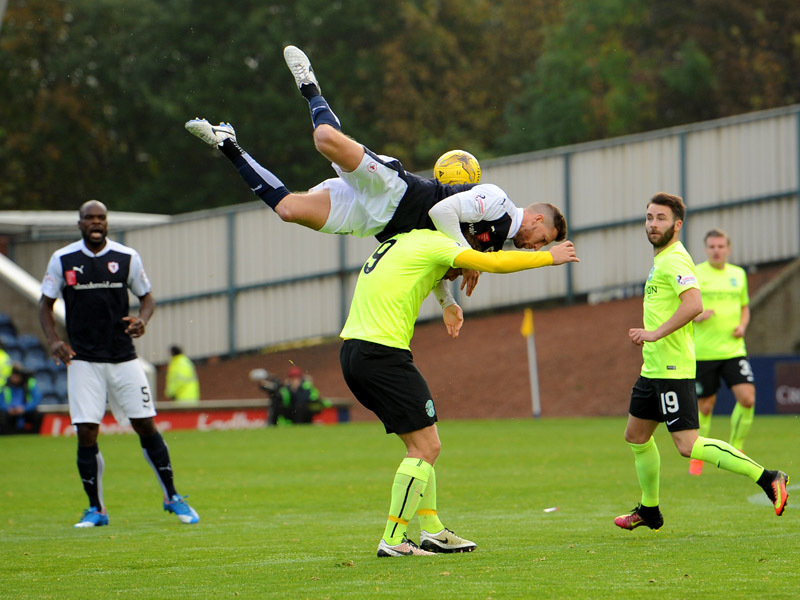 Raith’s defence was on red alert as a McGinn cross zeroed in on the far post; McHattie’s defensive header under huge pressure saved a goal-scoring opportunity. Keatings robbed a careless Davidson; his cross just evading a sliding Cummings. On the hour, Thompson’s volley into a forest of arms and legs fell to a grateful McGregor, who thumped clear. A moment later, a flowing move saw Barr cut inside and feed Callachan – the young midfielder cut inside at pace seeking to draw the foul from the off-balance Hanlon. Referee Finnie rebuked the Raith man, his yellow for simulation the right decision. 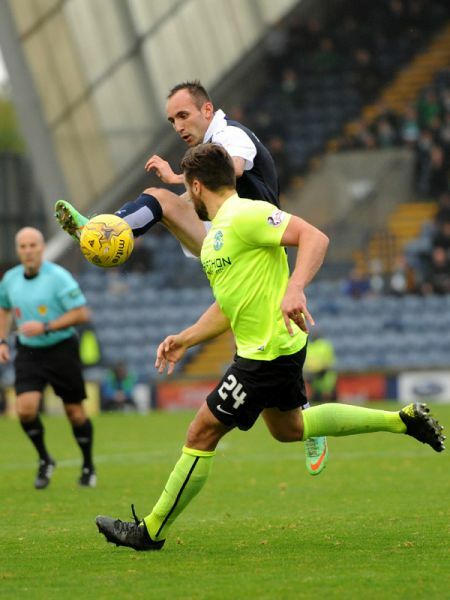 The last fifteen minutes saw Hibs comfortable in defence, and a constant menace to Raith’s defence. 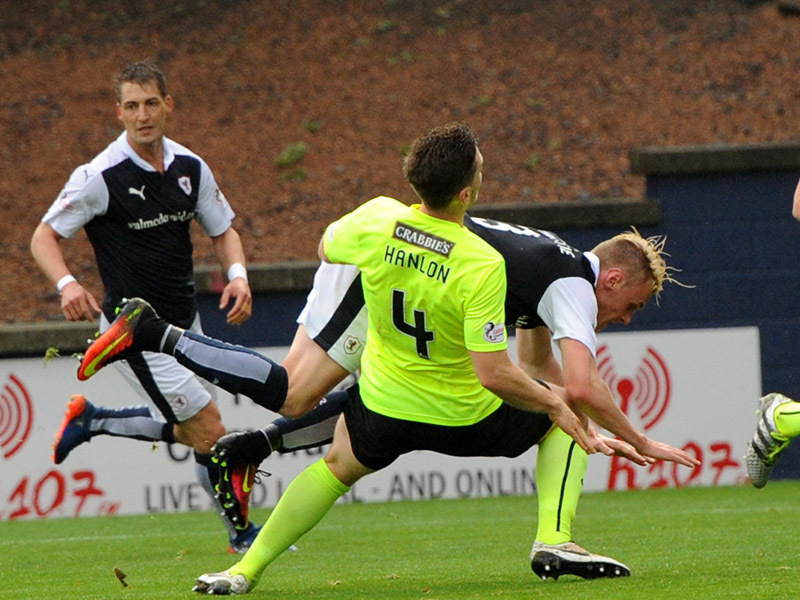 Davidson headed a Stevenson cross off the line, McGinn rounded Raith’s right-back and centred only for Benedictus to clear, and a rare sortie forward from Gray saw the full-back’s header drift wide of Cuthbert’s post. Vaughan and Stewart had been introduced for McManus and Skacel, but neither substitute posed a serious question of the Hibs rearguard. Vaughan wasted Raith’s final chance, sending a free-kick from a promising position high into the South Stand with Raith’s heavy infantry stationed deep in Hibs territory. In different ways, both sides can take positives from today’s point. 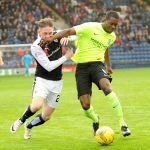 While home fans may feel Raith should have dominated by virtue of Bartley’s dismissal, Hibs pressed on despite the loss of their midfield enforcer. 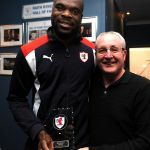 Real credit should go to Raith’s back-four – Benedictus, McHattie, Davidson, and man-of-the-match M’Voto each excelled against the League’s most potent strikeforce. Today’s clean-sheet was hard earned. The game's lacking precision but is competitive and entertaining. Raith defending solidly and attacking quickly, Hibs always look dangerous. Some meaty challenges flying in now, referee Finnie is trying to let the game flow but his patience is being tested! The red card has been shown, but it's not clear who to or why! +2 A good point, although we failed to make the extra man count. Solid defending against a very physical Hibs team. McHattie fouled in Hibs box? The first quarter of the season comes to a close this weekend, as Hibernian make the trip across the Forth to Stark’s Park. The two teams faced up to each other seven times last season, with Raith coming out on top twice, with both wins coming on their own turf. 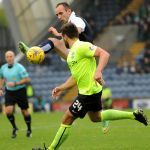 Lewis Toshney and Mark Stewart were on target as the home side won 2-1 in March, while Harry Panayiotou was the only goal scorer as Raith took a first-leg lead in the play-off quarter-final back in May. Hibs would turn that tie around however, before faltering against Falkirk at the next stage, and with Alan Stubbs heading south to Rotherham in the summer, Neil Lennon will be the man in the away dugout this Saturday. The former Celtic and Bolton boss has added six players to the Scottish Cup winning squad in the transfer window, two of whom will be familiar faces to Rovers fans. Ross Laidlaw signed up at Easter Road after leaving Stark’s Park in the close season, although he’s likely to be on the bench, with Israeli international goalkeeper Ofir Marciano recently being acquired by the Leith side. They’ve been joined to the roster by another ex-Raith player in Brian Graham, who’s scored two goals since joining from Ross County at the end of August. Fellow forward, Grant Holt could also feature on Saturday, along with the other recent additions, midfielder Andrew Shinnie and full back Neal Eardley. Whilst Lennon’s side hit the ground running with five straight league wins, a recent dip in form has seen them drop to second in the table, with Queen of the South now leading the way. Hibs away form is the best in the Championship however, with just one goal conceded on their travels this term, and just two points dropped, a 0-0 draw at table-topping Queens’. Hibs also have a strong head-to-head league record against Raith, with six wins and two draws from the last ten meetings.